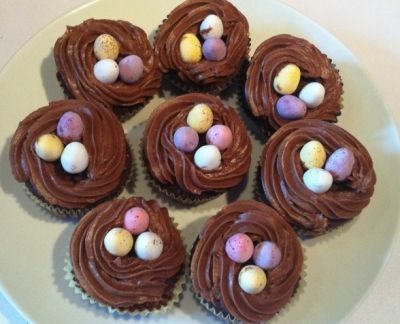 Simple and yummy recipes teaching you how to make bird nest cupcakes - perfect for Easter! Find a step-by-step tutorial on making these cute treats along with alternative recipes, ideas and more. 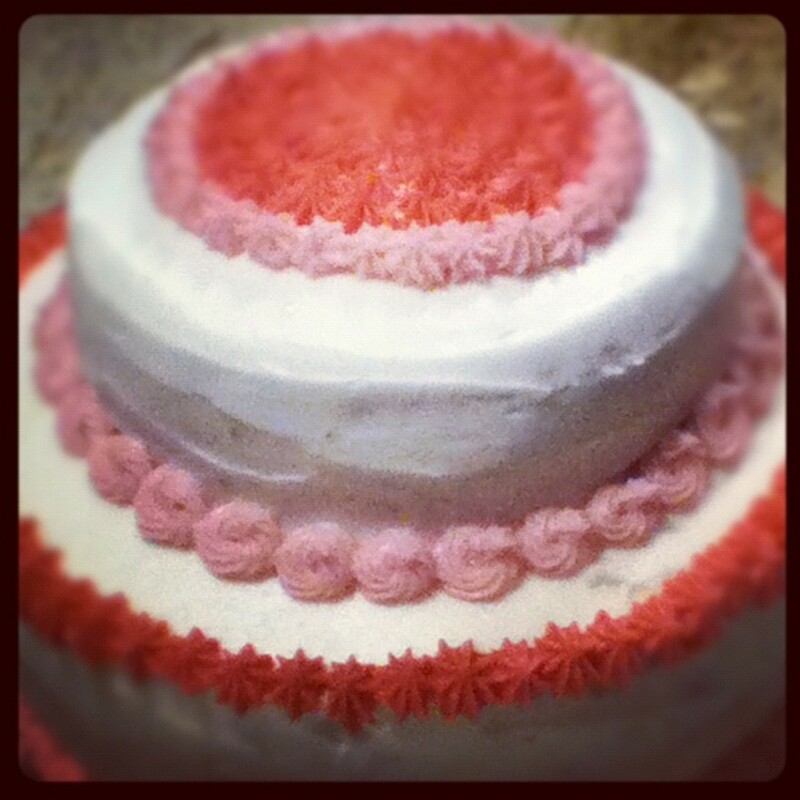 Learn to make them with buttercream or flakes, and mini versions as well as full size. 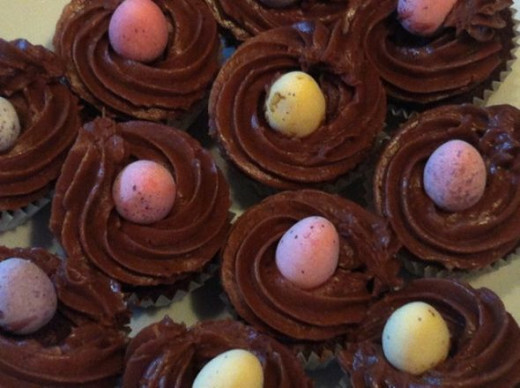 These would make a wonderful homemade gift or go down a treat at an Easter party! Read on to find out how to make them - they are easier than you might think! 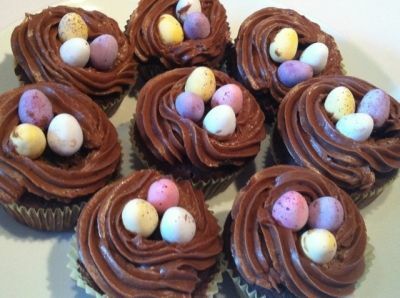 This is by far my most favourite chocolate cupcake recipe ever! The cupcakes themselves are moist and soft, while the buttercream boasts both beautiful texture and taste, without being too sickly. Spoon the mixture evenly between cases. Depending on the size of your cases, you may have some extra left over - if you have a smaller holed muffin tin and mini cases, you can use the mixture up and make mini cupcakes like the ones I have demonstrated further down the page. Or just make extra full sized ones! Cast your vote for The Best Bird Nest Cupcakes Recipe! Are you going to be making bird nest cupcakes? I wasn't going to, but after seeing these, I am now! 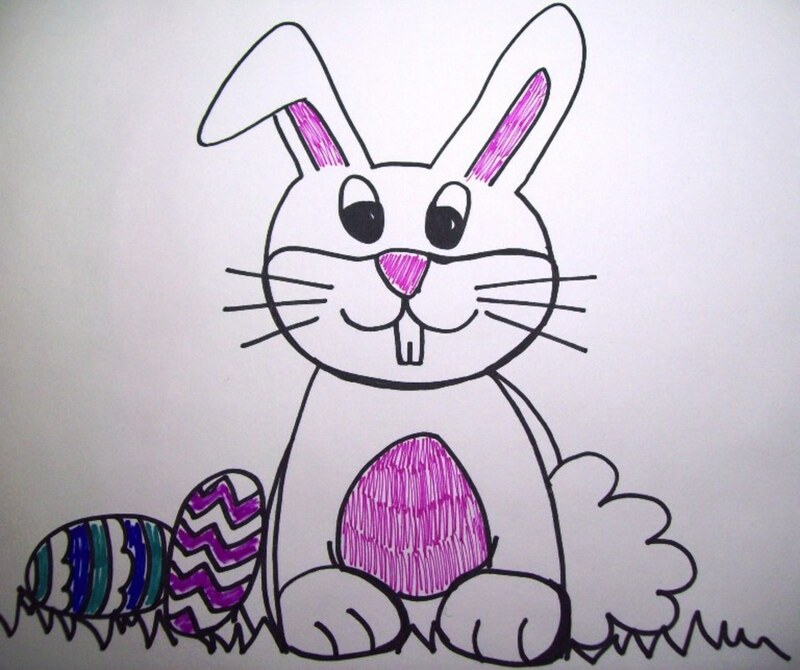 Make a Cute Easter Treat! These super cute cupcakes are a delight to bake for Easter (or simply for spring!) 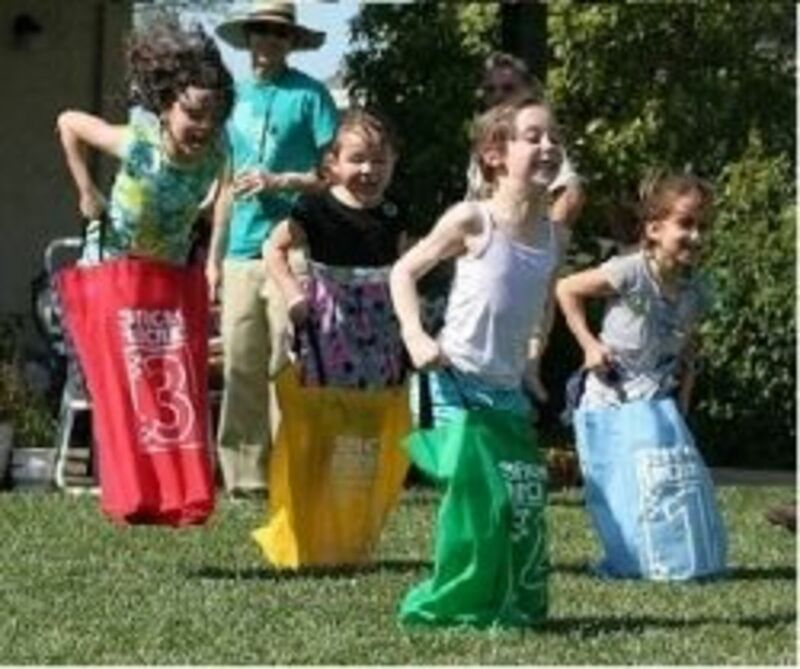 - they make a yummy alternative to chocolate eggs and look great at a party. 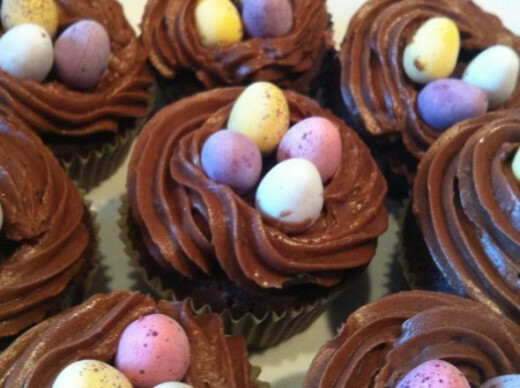 Why not bake a batch and give them to friends and family as homemade Easter gifts? For gifts, you could present them in an Easter gift box or Easter basket. For a party, display them with an Easter theme! I put my recent batch on a pretty tiered stand and decorated it with some cute little Easter chicks. I put some artificial flowers behind them to give a spring feel as well. You could present yours on an Easter-themed stand, in an egg-shaped bowl, or even in a homemade nest! Why not glean some inspiration from these bird nest themed articles; Decorating with Birds Nests or Birds Nest Crafts? You can get nests intended for party or wedding favors which would be perfect for popping a few cupcakes in, and would work really well with the mini cupcakes recipe, too! Another super cute way to add extra Easter décor to your cakes is to place a sweet little birdie cupcake pick in each one, or nestle a little fluffy chick or bird on top of the mini eggs! As I mentioned in the main recipe above, you can also make mini versions of the the cupcakes. Just use mini cases and a 12 hole mini cake pan. You can either make these as a separate project (in which case, the above recipe for 12 standard cupcakes will make 24 or more mini cakes) or use any leftover batter and icing to make these as extras. When you come to ice these tiny versions, pipe the icing around each cake once, so it fills the entirety of the cake top. Then nestle one little mini egg in the centre. Yum yum! These are great for little ones or those with smaller appetites, or for when you fancy a treat but can't manage a whole one! Quick and Easy Bird Nest Cupcakes - Simply But Yummy! 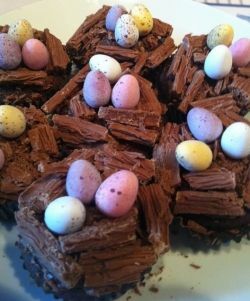 If you want a less rich chocolate combination, or just a quicker, easier recipe to rustle up, this is the one for you! This recipe is less complex than the first, as the mix can be made quickly all in one bowl, as can the buttercream. It is, however, another very yummy recipe, so perfect for serving up to guests or as gifts, without having to spend ages making them! 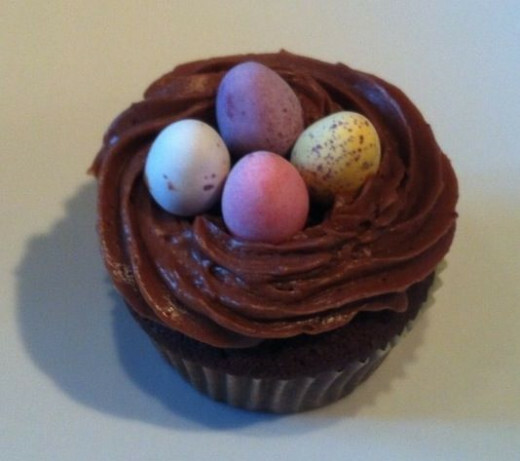 Place 3-5 mini eggs in the centre of each cupcake, serve and enjoy! Bird nest themed Cricut cartridge suitable for cake making and crafting! My 3-year-old daughter LOVES baking cupcakes with me, and eating them too, but she doesn't like buttercream. So, if you want to make a cool nest cupcake with a topping alternative, what to do? My little girl likes glace icing but that is no good here, so we opted for crumbly chocolate flakes to create the nests instead! Because I made a batch of these at the same time as the other ones, I used a little of the leftover buttercream as a "glue" for the flakes. Using the back of a spoon, I smoothed a little over the top of each cake. If you're making these on their own, you could whip up a little bit of glace icing with some icing sugar and boiling water - it will work the same! Let it cool a little if you use this method, so that it's not runny, but pop the flakes on before it sets. Carefully cut up pieces of chocolate flake with a sharp knife, and place them on top of the cupcake to form a nest. 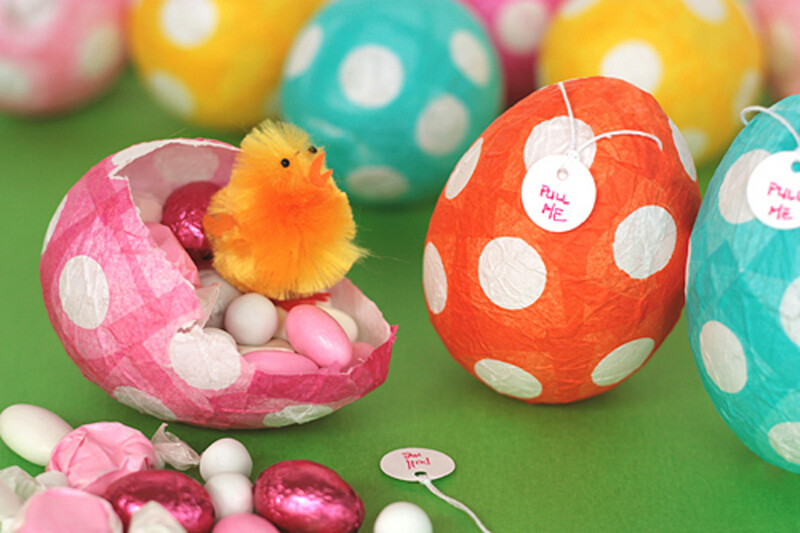 When happy with the designs, place 3-5 mini eggs in the centre of the nest and voila! Which of these recipes was your favourite? This was the book I immediately turned to when seeking inspiration for my first batch of these particular cupcakes. The recipes (and photography) in this book are to die for!! Filled to the brim with incredible cupcakes and cookies, divided into the four seasons. You'll find everything from bird nests to graveyards, mini bonfires to Bollywood brights, pastel biscuit treats to decadent party cupcakes, and everything in between, including a variety of cocktail cupcakes! And what's more, it's all illustrated with sumptuous fairytale photography. 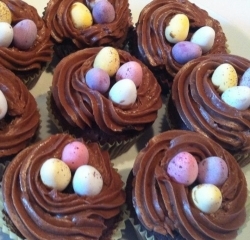 These are a cute variation - buttercream on first, then a central sprinkling of chocolate sprinkles or shavings to make the nests, with eggs in the middle! These look very stylish, topped with slices of chocolate finger biscuits to make the nests, and placing a single pale blue egg in the centre. These are amazing! These yummy vanilla cupcakes are topped with chocolate buttercream, then the remaining topping is tinted to pipe three little baby bluebird heads, before forming nests around them with shredded coconut! These look amazing, sound delicious and I will definitely be trying these! It combines an adapted honey almond cake recipe with a honey syrup recipe to make the topping and nests. These mini cakes are just adorable - tiny little nests small enough to fit inside an egg carton - just check out the super cute photos if nothing else! To leave a comment you need to be signed into Squidoo. You can sign up for a free Squidoo account or easily sign in via Facebook or Twitter when you submit your comment. Craving a Sweet Tweet? - Leave your Comments and Feedback here! The hard part is not eating all the eggs in the process. Love your lens! It been featured on our Google+ page today, so come and check it out! These bird nest cupcakes are just too adorable. Must make some. Thanks for so many wonderful, delicious, cute ideas. When I saw the title on Review This! I just had to get over and see these cupcakes. AND right away I see CHOCOLATE! Perfect. 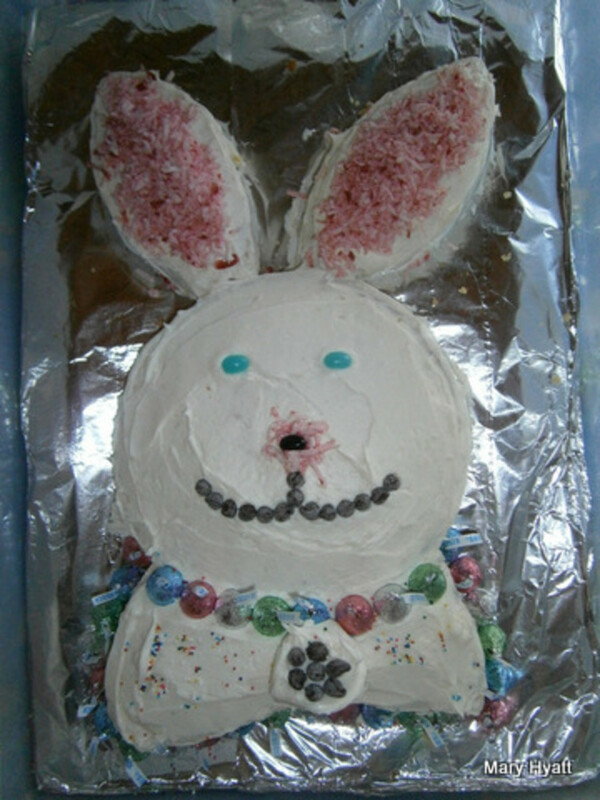 Now I know what to make for the grandgirls when they come for Easter dinner. These are just as cute as they can be. While they are making me want some chocolate, I can't help thinking about how adorable they are, almost too much so to eat. Cute idea. I am curious how you made the eggs look a little speckled or weathered like a real egg that might be found in nature as opposed to smooth surfaced eggs right from the package? 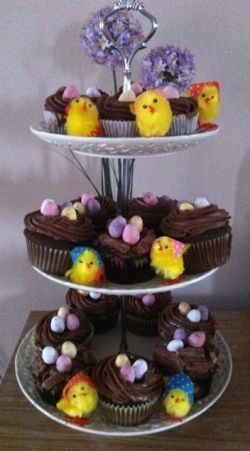 Your bird nest cupcakes are so cute and I'll have to make some for Easter. They look so cute. I might just have to make some as a spring treat. I like these because they are not too fussy like some over fiddly cupcakes. I used to make these years ago but had forgotten about them. Blessed! These look so good. I love cupcakes. These are so wonderful! Blessed by a SquidAngel! Think I'd like the flake type nest best.